The carcass of a massive gray whale washed ashore in Malibu early Sunday morning, stunning beachgoers who said the decaying body gave off a strong odor. California Highway Patrol in Ventura County said they received a call about a beached whale on County Line Beach "the size of a semi truck" at 3:11 a.m. Authorities said they reported the situation to Channel Islands Marine and Wildlife Institute. 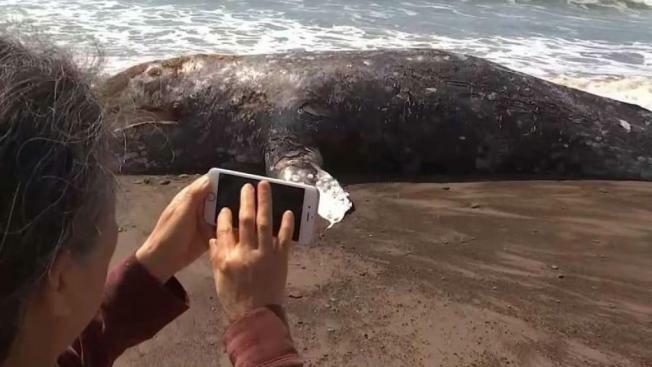 As the sun came up, crowds approached the decaying sea mammal and began to take photos of the whale, questioning what the cause of death could have been. That remains unclear until Diane Alps and her colleagues from the Channel Islands Marine and Wildlife Institute perform a necropsy on the whale Monday morning to determine the cause of death. Alps estimates the whale's carcass is approximately 40 feet long. The body of the gray whale will remain at the beach throughout the night. California's coast is a common migrating route for gray whales, according to the Marine and Mammal Center’s website. The whales can usually be spotted swimming off Southern California’s coast from March to May as they migrate north, the website states.